MOLEMAX HD PRO is at the cutting edge of technology bringing dermoscopy to a new level. 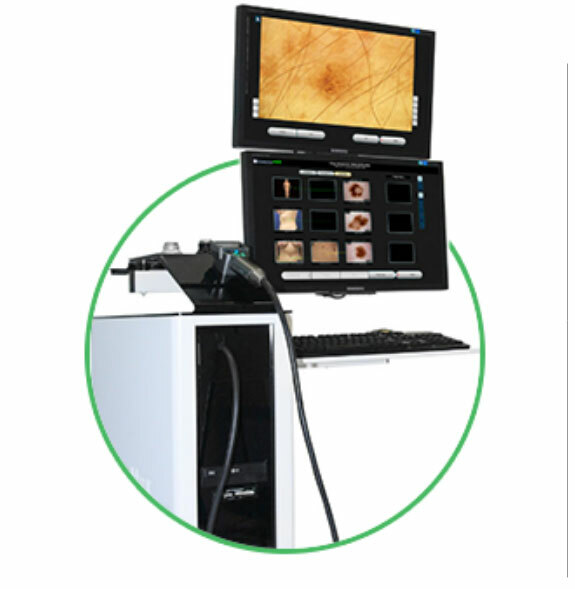 This device together with its unique software has the highest level of skin imaging and disgnosis. The Total Body Mapping Set was designed to standardise and facilitate examination and documentation of all skin diseases. The “Body Mapping” function provides guided photographic documentation of the entire body based on 33, or for quick examinations on 10 preset body segments to identify new moles for melanoma prevention. • TBM Stand with adjustable rail that can slide up and down with lock-in intervals every 10cm, allowing for images to be taken from the patients feet to their forehead. • Unique light sources allowing for a clear, bright, non reflective image to be taken of the patient’s skin. Molemax was developed for dermatologist and sold mostly into hospitals around the globe. While the hospitals deploy this technology every day, private dermatology clinics are rolling out this system as patients want the procedures carried out without the waiting times that occur in the public health systems. There is also greater access to histology and private referrals across Europe now making aftercare following diagnosis easier and more accessible.